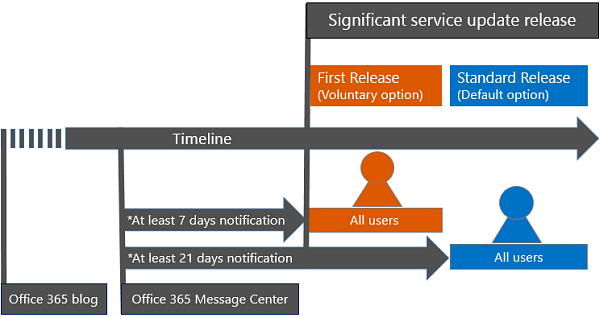 It’s been almost a year since Microsoft published Improving Visibility to Service Updates, but few business customers are aware of the informative Office 365 Roadmap. PCWorld quickly followed with Office 365 Here’s What’s Coming and InformationWeek added Microsoft Reveals Office 365 Public Roadmap. However, nothing has been mentioned since by the press about the unprecedented speed of new features offered or the frequent open communication. For example, neither Apple or Google publish a public roadmap on any product. As of April 2015, Apple doesn’t even have an official blog. AzureAD sync for Yammer – Allowing organizations secure control by user and group of what can be shared internally and externally. Data Loss Prevention for SharePoint Online – Over 50 sensitive information types provided to ensure regulation compliance for file sharing. ExpressRoute for Office 365 – Establish a private managed connection between your network and Microsoft datacenters for premium performance with a single provider. Increase Message Size Limit to 150MB – Most competing services currently limit file attachments to just 10MB or 20MB. Unlimited Storage for OneDrive for Business – Moving forward, all Office 365 customers will get unlimited OneDrive storage at no additional cost. Google Apps only provides 30GB per user. Now you’ve learned about a new resource to keep current, as well as some new tools to help your daily life. Take a few minutes and explore some of these features, follow our blog for the latest in streamlining technology, and test drive Office 365 if you’re not on the cloud.